No, I'm not a hoarder (once again, depending upon who you ask) saving my hair clippings and old fast food wrappers in the shop...those go in my underwear drawer. 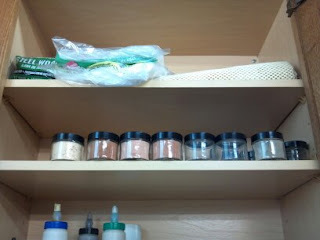 I save the little labeled jars of sawdust for times of emergency. Sometimes, I need a small repair (although I'm reluctant to admit that fact) while I'm in the middle of a project. The typical problem is matching my repair to the work perfectly enough that it doesn't stand out to a scrutinizing eye. One of my favorite repair methods for small mistakes is to make my own wood putty...which is where the sawdust comes into play. The only sawdust I save is for woods that I work with consistently. Some of the best sawdust for this application is out of the sander because it is so fine. The trick is getting clean sawdust. What is clean sawdust you ask? 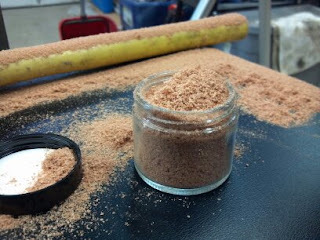 Clean sawdust shouldn't have any varying species in it (all one species of dust) and should be free of dirt and debris. 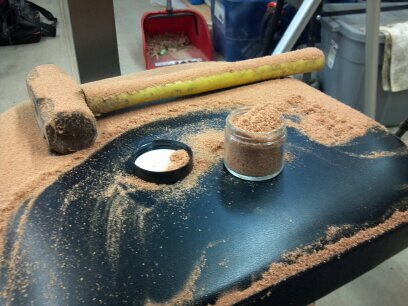 The ideal sawdust for this repair method is dust from the piece you are working on, because it should match perfectly. Sometimes, however, getting clean sawdust while engulfed in a project is difficult, which is why I save a little. I saved some Brazilian Cherry sawdust from the miter saw. The miter saw gives different shavings depending on the style of cut made (rip or crosscut) and these are crosscut. These shavings are a little more rough than those out of the sander, but they do a good job of mimicking grain in a repair. 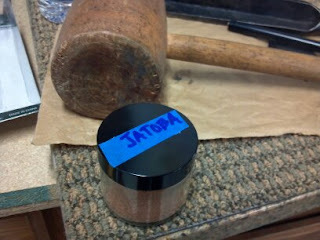 To make the putty I mix a little sawdust with some yellow or clear drying wood glue. I pack the glue into the fix with a dental spatula or a small toothpick and wait for it to dry. I tend to wait "time and a half" of the recommended drying time. As the glue in the sawdust dries the patch will shrink slightly. If the fix isn't totally dried when it is sanded, the shrinkage will be noticeable as a divot in the finished piece. Once everything is sanded and cleaned up (be mindful of any stray glue on the finished piece), it should finish up the same as the rest of the piece.